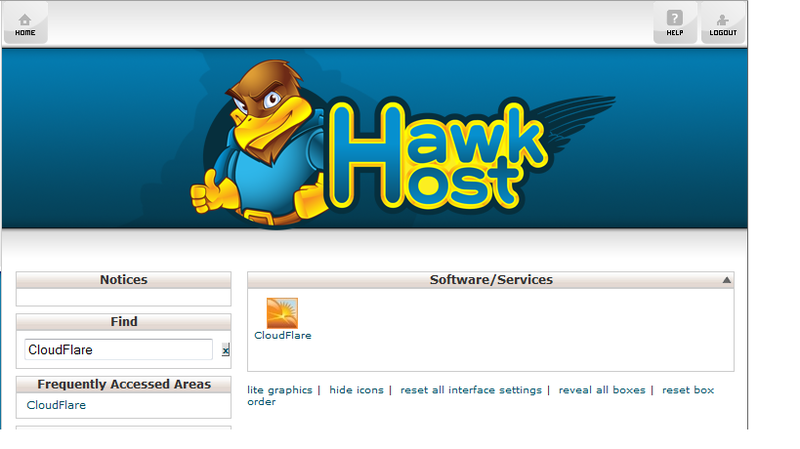 We’re thrilled to announce that Hawk Host is now officially a CloudFlare hosting partner. As of this post that makes us one of 25 official hosting providers worldwide. While you’ve always been able to utilize their services with our hosting plans, you guys can now create an account and activate CloudFlare with the click of a button right through your control panel. Your site loads faster, uses less bandwidth, and serves fewer requests by filtering out the malicious traffic. Increased security measures. CloudFlare makes use of its global network to identify malicious traffic and filter based on that detection. Curious what else you get? Take a look at the CloudFlare plan comparison page and checkout the free plan. Everything listed there is what’s included in the account you activate with us. One of the coolest things about CloudFlare is they offer their basic protection free of cost to anyone with an account. This means you’re able to make use of all the great features, improved performance, and peace of mind without spending a penny more. They do offer a paid plan which you can upgrade to at any time, called CloudFlare Pro, which brings additional features to your site. With a Pro account, you’d have access to features like a website preloader, advanced security measures, and more frequent stat updates for your traffic. I’m sold. How do I activate CloudFlare with my Hawk Host account? Right now, this service is only available for our shared hosting customers. Thanks to some crafty programming over at CloudFlare, their team has come up with a native integration right into our control panel software, cPanel. To make your site CloudFlare enabled, login to cPanel and look for CloudFlare either by using the finder or looking for it under the Software/Services section. Once you’ve located the icon, click through and you’re going to be asked to create an account. All you need to do here is provide your email address and accept the terms of service (which you should read first) and an account will be created for you automatically. At this point, you’ll receive an email from CloudFlare welcoming you to their services and providing some basic information about their company, where to get started, etc. Now that you’ve created the account, you’ll be looking at an interface in cPanel which lists your accounts domains. Next to each domain name is a cloud and by default the cloud will be grayed out, with a status saying that the site is not powered by CloudFlare. To change this, simply click on the grey cloud. Once you do this the cloud will change orange and your site will now be CloudFlare enabled. Pretty simple, right? Once enabled, you’ll be able to view your site statistics (after they process, which initially takes 24 hours) and also manage some basic security settings. To view all of your account settings, details, and options you’ll need to login to your CloudFlare account directly. A link to login to your account is provided right on your cPanel page. Does CloudFlare provide anything else? The ladies and gentlemen over there seem to be a busy bunch, whether it be adding more features to their lineup, improving their already impressive API, or releasing plugins/software for commonly used programs. They’ve also got this little setup called CloudFlare Apps. Their Apps setup provides for one click installs of some very common web apps. Some more well known Apps they’ve got include Google Analytics, Google Webmaster Tools, Pingdom, and VigLink. Take a minute and review them all, you never know if you’ll find something useful. In addition to their Apps, CloudFlare also provides a WordPress Plugin, a Joomla Extension, and a Drupal Extension. The team behind CloudFlare is also responsible for Project Honey Pot, a web based service aimed at identifying and stopping bots and spammers that attempt to scrape addresses from your website. Where can I read more about CloudFlare? To start, their website. From there, their blog can actually be pretty engaging and provide some awesome insight into web traffic, site performance, or the web in general. They’ve also got a bunch of info throughout their site like staff profiles, company history, and the usual content any company throws your way. Like most other companies these days, they’re also on Twitter and Facebook so you can stay social with them as well. Luckily for everyone, CloudFlare provides an incredible amount of documentation and a very easy to use interface for your account. Any questions or confusion you have can easily be cleared up with a little searching, and if not their team will be able to help you out. 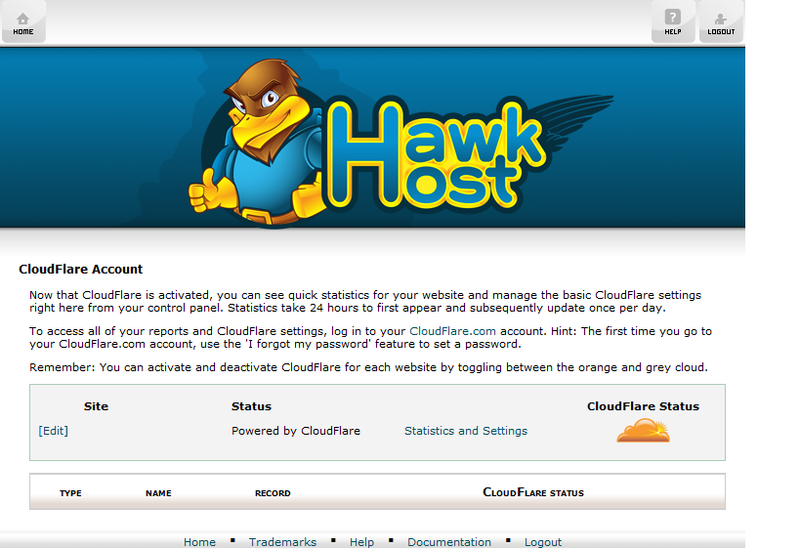 We here at Hawk Host are pretty excited to bring CloudFlare functionality to our hosting services. We’re confident they can provide tangible results for our users and create a situation where everyone benefits from the added performance. Since this is a new service for us we’re extremely open and receptive to any suggestions, comments, or ideas you think would improve the experience. Leave a comment here, post in our forums with your thoughts. This entry was posted in General and tagged cloud flare, cloudflare. Bookmark the permalink. First of all this two Company is absolutely great. Hawkhost alone gives faster site performance. After two week I saw Cloudflare and I’m impress to their front page video which I am very glad to integrate to both hosting and their service. But after I manage to complete the configuration after3 days my site starting to become slower which I really don’t know why. I try to deactivate for the meantime the service of Cloudflare and to my surprise my site it back to normal which means that Cloudflare makes my site slower and I dont know the reason to this issue. Hope this issue will brought up to Cloudflare and to Hawkhost. I only knew about ClodFlare but never understand what it is. LOL. Since HawkHost use it, I think it worth to learn. I’ll try to learn what is CloudFlare and if it is really great, I’ll use it for my account. Thanks for the wonderful jobs! I tried CloudFlare but they disappointed me with their less than satisfactory uptime. Also, I noticed my site was faster when directly delivered from Hawk Host instead of Cloudflare proxy. Their bad uptime really is the turnoff for me. If they can manage Hawk Host like uptime then I will surely try them again. I run iThemes and Wordfence plugins on my WP site on Hawkhost. I intend to use Jetpack’s CDN as well. Would Cloudflare add any value here?